Hola from Costa Rica! We’re now a week and a half into the second term of our 2014-15 school year, and positive vibes are the order of the day. Our upper classes have made the UGA Costa Rica campus their home for the next couple of months to focus on their International Baccalaureate coursework. Our ninth and tenth grade classes, on the other hand, have the distinction of having embarked on the longest weXplore expedition in school history. The month-long trip, which doubles our time spent in Bhutan and Tanzania, is an opportunity to really step away from classrooms and textbooks and instead use all five senses to really experience Costa Rica and the pura vida. This holistic, place-based learning approach really made our two weeks in Bhutan special, and we feel our students will walk away from this month-long journey enlightened and enthralled with the country they’ve come to know so well. Here’s a look at what we have planned over the next few weeks, and if you’d like to follow along with our journeys, you can follow our journey through the Instagram hashtag #tgspuravida or on Facebook here. As our lower grade students, staff, and faculty zig-zag their way across nine different Costa Rican regions, they are accompanied by a team of seasoned educational adventure specialists from Broadreach. Before we even arrived in Costa Rica, Broadreach had prepared an elaborate thirty-day itinerary that includes visits to cloud forests, rainforests, both coastlines (Costa Rica is bordered by both the Atlantic Ocean and the Pacific Ocean), and will allow our students to trek through jungles, walk on beaches, float down rivers, zip through the forest canopy, gaze at volcanos, and surf on the ocean. Along the way we’ll also visit several exotic research centers and off-the-beaten path field stations where our students can interact and learn from conservationists who have taken to calling Costa Rica home. Biodiversity is just one aspect of our weXplore, however. Rivaling Costa Rica’s natural beauty are its citizens’ friendly demeanors and tico culture, which we’ll familiarize ourselves with through visits to archaeology sites, farms (on Monday our students received a lesson in making cheese), religious sites, and a variety of other stops along the way. Key topics that will be explored over the course of our weXplore include Costa Rican geography and mineralogy, pre-Colombian history, conservation, agriculture and economy, and tropical ecology. Click on any of the numbered locations below for a photo and highlights of the activities that will take place. Service learning is an integral component of the THINK Global School mission, and we strive to make a contribution through physical labor that benefits our host country’s residents for generations to come. In Costa Rica, our students will work side by side with community members for three full days at an orphanage in Cartago (a 30 minute drive from Orosi) assisting on a few different projects: hydroponic gardening, building a hydrophobic structure, planting herbs, constructing a fence, weeding, and playing with the children while practicing their Spanish. These service projects are always well-received by our students and typically end up being a highlight of the itinerary. Our time in Moshi, Tanzania, last year provided our students with an opportunity to help construct a new school for the local children — an activity that 12th grader Joseph H. found motivating and fulfilling. You can read his reflection on his time in Tanzania here. Monte Verde cloud forest hike (concluded): Our month long tour of Costa Rica kicked off high above sea level (4,662 ft/1,440 m) in the serene mountain town of Monte Verde, where our host school, University of Georgia Costa Rica, is located. The high altitude of this mountain town results in an abundance of slow-to-evaporate moisture –often in the form of clouds and fog– which nourishes the over 100 species of mammals, 400 species of birds, and 2,500 species of plants that thrive in this delicate ecosystem. Our activities in Monteverde included an introduction to Costa Rica’s history and Spanish, a hike through the cloud forest to study the area’s biology, and the opportunity to zipline through the massive trees that spring up from the rich soil. Much to our delight, Monteverde’s near-continuous rainfall leads to remarkable rainbows frequently forming in the sky. Rainforest research station: Science will be the name of the game when we head into the rainforest near Cariari to become full-fledged biological field researchers. For four days and nights we’ll call a local research station our home, and after an orientation on the station and a lesson on rainforest wildlife we’ll spend our days hiking the grounds of this beautifully protected site to observe primate activity and gather census and behavioral data. We’ll also have the opportunity to see how the research facility impacts the natural environment and the local community during a volunteer opportunity in a nearby rural town. Flashback: In 2011, during our Ecuador term, we had the prestigious honor of being the first high school group ever allowed to visit the Tiputini Biodiversity Station. Here’s a video package put together by Media Specialist Lindsay Clark highlighting our time there. After wrapping up the whitewater rafting portion of our journey, we’ll hike for several hours into La Amistad International Peace Park. The park, which straddles the Costa Rican-Panamanian border, is the largest protected region in Costa Rica, and remains largely unexplored. It is home to several protected areas reserved for the indigenous Chirripó, Tayni, Telire, Talamanca, Ujarras, Salitre, and Abagra peoples, and our hike will culminate in a visit with one such tribe for a firsthand glimpse into traditional Costa Rican life, and how they manage to balance tradition and modernization. In November of 2012, we had the privilege of meeting members of the Guarani tribe, who call the land in Argentina and Brazil around the sacred Iguazu Falls their home and who struggle to cope with the modernization of their homeland. Hopefully our encounter at La Amistad is as pleasant and thought-provoking. Marine research at Drake Bay: Our month-long journey ends off the coast of the Pacific Ocean with a four-day visit to Drake Bay. Named after the intrepid explorer Sir Francis Drake, Drake Bay is a marine biologist’s paradise. During our time here we’ll head out into the bay to spot dolphins and whales, with our findings being submitted to local research partners who collect marine data in an effort to conserve the diversity present in this magnificent bay. We will also take breaks to snorkel the crystal blue waters and hike through the rainforest of this world-renowned biodiversity hotspot. All good things must eventually come to an end, so what better place to do so than the beach? 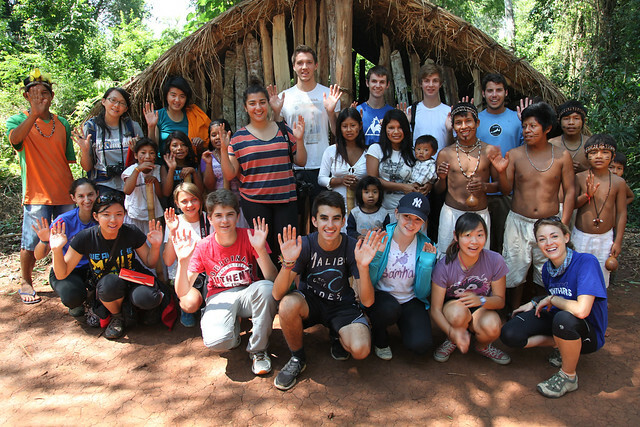 Is place-based learning in Costa Rica how you want to spend your high school years? Learn how to apply on our admissions page, make sure you have a few blank pages in your passport, and maybe we’ll see you in 2017-18!